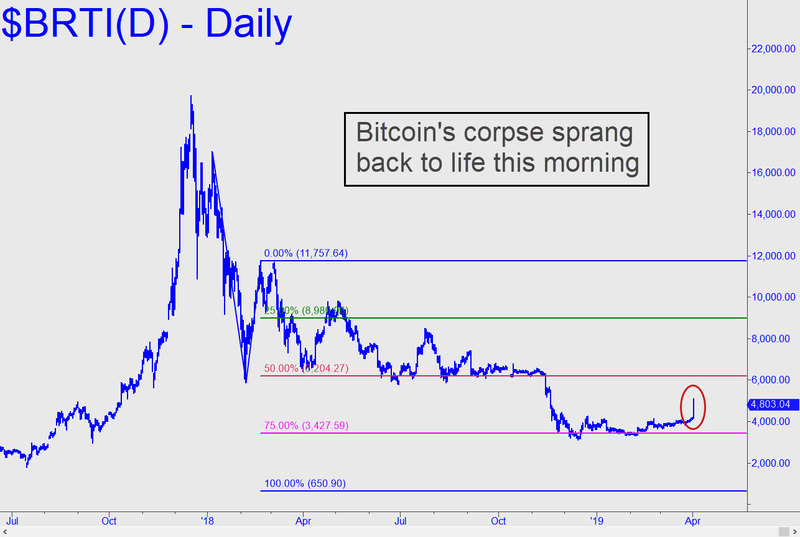 Bitcoin’s Corpse Leaps from the Grave. But Why? On a chart (click on inset), the cryptocurrency looks like it sat on a Whoopee Cushion. Cosmic rays aside, another plausible explanation is that the imbeciles who bought into the rally simply forgot about myriad factors that have been weighing on bitcoin for the last 16 months, pushing it 75% beneath the December 2017 high of around $20,000. If a score of high-profile embezzlement and theft scandals weren’t enough to ward off thrill-seekers, the recent announcement that the Cboe, the first exchange to list bitcoin futures, plans to kill the contract after June should have slowed the action to a death crawl. Instead, we got enough of an effusion on Tuesday that more speculators could get sucked in over the next few days. Some called the rally an April Fool’s joke. Indeed it was, no matter what its cause. The Bitcoin rally makes me think that I should perhaps place the million shares of Erie Railroad stock my grandfather left me on the market! Boss Tweed gave him a package deal on the Erie stock, plus a nice chunk of Brooklyn Bridge stock as well! Just think of all the stock splits since 1871! Just the thing for the underwater Chicago pension plans to enable them to return to solvency!